You are a new driver and have been overwhelmed about the lanes in Manila. You need to turn right so you start turning to the right lane. As you get nearer to your destination, you found out that you need to take the ramp on the left lane so you can go and cross to take the street on your right. You need to swerve, but it is too late, the MMDA enforcers are there ready to apprehend you because of swerving. 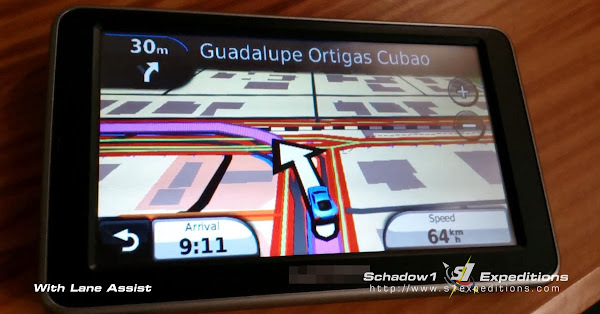 How you wished your Philippine GPS map is compatible with lane-assist navigation. 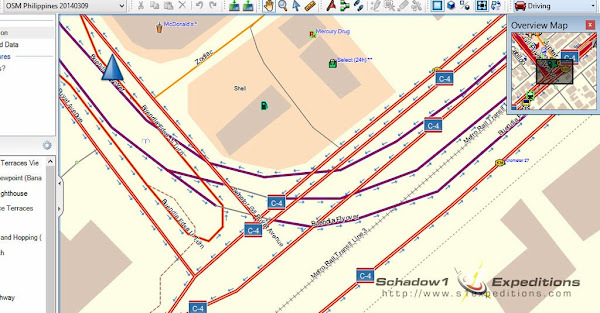 Starting March 10, 2014, the Philippine GPS Routable Map based on OSM-PH data compiled by Schadow1 Expeditions will be compatible with Lane Assist Navigation. No need to worry about swerving lanes or missing the ramp as you will be informed in advance on the right lane you should take while driving. If your GPS navigation device is compatible with lane assist, the display will indicate an icon on which lane you should take. And if in case you are using an older GPS with no lane assist capability, do not worry, the Philippine GPS Routable map will indicate the lane you should take based on the signage. 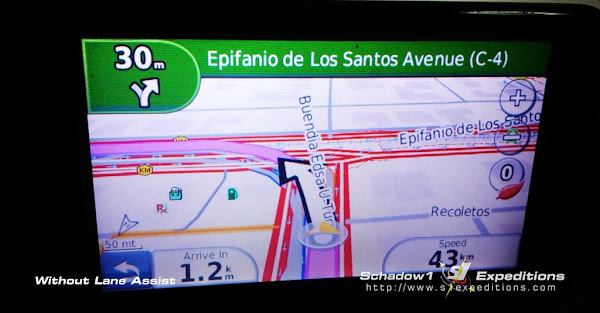 An example below is the the satellite navigation display when you plan to turn right and get to Cubao coming from Gil Puyat Avenue; where you need to take the ramp heading to Guadalupe | Ortigas | Cubao. While the overview map will still show you the correct road name as shown below. How the lane-assisted map will work on a non-lane-assisted hardware. Previously, the Philippine GPS routable map will only indicate the name of the highway which is very vague in case that highway has 6 lanes. On the new version, your destination is indicated so you will no longer need to figure out which ramp or tunnel or lane you should take while driving on a wide Philippine highway. Previous version that is not compatible with lane assist. As of the time of this writing, the OSM Philippines data are still being updated to give way to this feature, however, the Philippine GPS Routable data compiled by Schadow1 Expeditions is now ready to accommodate the data changes. 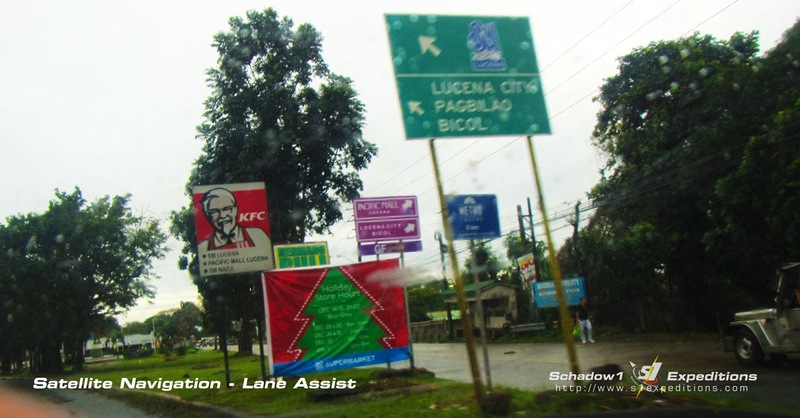 The lane assist data is currently available for the major highways in some parts of Metro Manila and Luzon. If you have local knowledge of the lane data on your location, go ahead and update the Openstreetmap data so the changes will reflect on our Philippine GPS routable map which is updated about twice a week and is available for free. And if you are new to contributing mapping data, go ahead and LearnOSM.